Fourteen novels, three short story collections, five plays and five works of non-fiction stand as a towering testament of Kurt Vonnegut’s ability to show us the fantastic in literature, and the extent to which books and writing can make us feel sublime. He is rightly admired by writers, readers – and most people who have had the fortune of stumbling across some of his work. Countless resources exist within the babbling expanse of the internet, based on his writing, and what he can teach us about writing – from the perspective of the writer, the reader, and the human being. 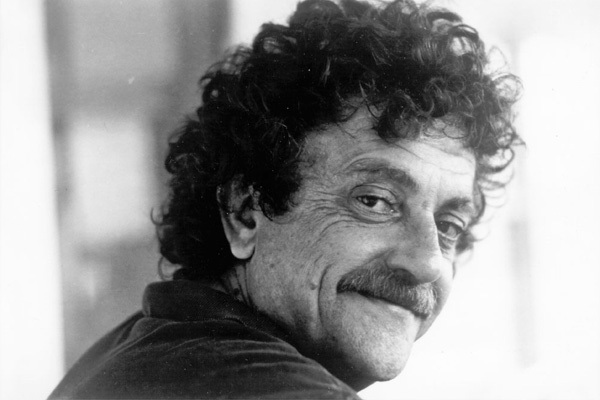 In this article, we attempt to bring some of these resources together – a mini-compendium featuring some of Vonnegut’s timeless wisdom on writing. By way of introduction, we believe it is of paramount importance to highlight Vonnegut’s self-defined “first rule” of writing. Lovers of the semi-colon should look away now. Leave those semicolons by the wayside, then. Now, onwards and upwards! A much viewed clip available on YouTube is an old favourite of the team here at Nothing in the Rulebook. In it, Kurt Vonnegut maps out the shapes of stories, with equal parts irreverence and perceptive insight, along the “G-I” axis (Good Fortune and Ill Fortune), and the “B-E axis” (Beginning and Entropy). The footage, an excerpt from a much longer talk, is best accompanied by the transcript of the full talk – in ‘A man without a country’, an almost-memoir Vonnegut published in 2007. 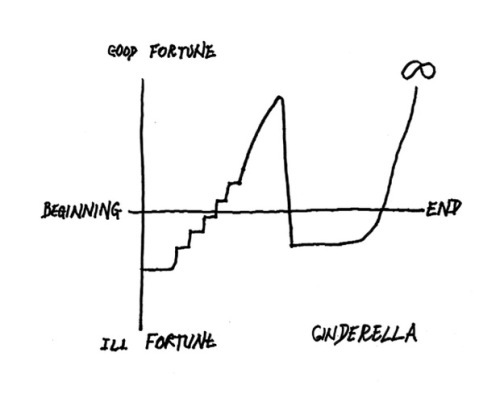 The fundamental thesis behind the delightful graphs Vonnegut uses to depict everything from Cinderella to Kafka to Hamlet, is that, in his own words “stories have shapes which can be drawn on graph paper”. Yet this thesis, which he submitted in pursuit of a master’s degree, was rejected – according to the man himself – because “it was so simple, and looked like too much fun”. Interestingly, these plottable graphs have been creatively reimagined by graphic designer Maya Eilam, in new infographic format. Vonnegut’s 1985 essay, “How to Write with Style”, published in the anthology How to Use the Power of the Printed Word, begins by reprimanding what he perceives as the impersonal sterility of journalistic reporting. This fuelled by Vonnegut’s musings on the single most important element of style, which writers of all creeds must possess – a revelation of self. “Newspaper reporters and technical writers are trained to reveal almost nothing about themselves in their writing. This makes them freaks in the world of writers, since almost all of the other ink-stained wretches in that world reveal a lot about themselves to readers. We call these revelations, accidental and intentional, elements of style. Choose to ignore such a warning at your peril! The idea of finding your ‘routine’ as a writer is often bandied about and discussed at great lengths on various writing forums, threads, advice boards, literature festivals, creative writing seminars and classes, and so on. Writing is, after all, a discipline; and is perhaps more about working terribly hard at something and focusing intently on that, rather than simply spending your days living life as a “creative”. Yet recognising the importance of a writing routine and actually developing one is a trick not learned easily – and made more difficult by our increasingly 24-7 lifestyles (both working and social). For inspiration, Vonnegut serves as an icon to aspire to, with his gruelling daily routine, often noted in a marvellous collection of his letters. 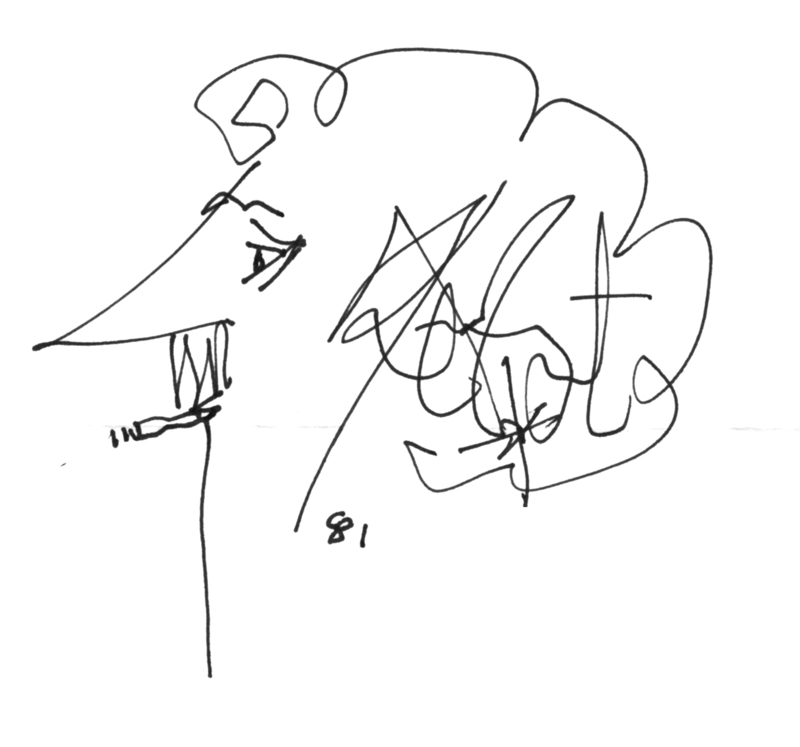 In one letter to his wife, Jane, dated 28 September, 1965, for example, Vonnegut describes how he would work for 90 minutes before a short break for breakfast at 8am, then continue working until 10 am. Here, he then walks into town, runs errands, swims at the local pool, returns to his house for lunch at noon, then spends the afternoon preparing for his classes (he was working at the prestigious Iowa Writers’ Workshop at the University of Iowa), then an evening spent reading and listening to jazz music. Throughout the day he does “pushups and sit-ups” and occasionally visits the cinema, where he has his heart broken. Perhaps it’s time we all brought a little more discipline and heartbreak to our writing routines! Finally, one last, and perhaps most important piece of advice from Kurt Vonnegut. One year before the author’s death, he wrote a letter in reply to a group of New York City school children who prevailed upon him to come and visit their school. His thoughtful reply provides advice that goes beyond tips for writing or reading; and instead simply teaches how to lead a good life. Here’s an assignment for tonight, and I hope Ms. Lockwood will flunk you if you don’t do it: Write a six line poem, about anything, butrhymed. No fair tennis without a net. Make it as good as you possibly can. But don’t tell anybody what you’re doing. Don’t show it or recite it to anybody, not even your girlfriend or parents or whatever, or Ms. Lockwood. OK?